If you have an old photo or two of your time with the Division and would like to have it posted on our web, send me a JPEG or GIF image of it via email and I will try to add it to the site. I need info about the picture as well . i.e. names, dates, where, etc. Please note that there is a limited amount of space and not all images can be posted. Send me your images and/or comments to the webmaster. 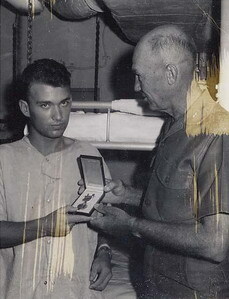 General Bruno Hocmuth presents Wayne "Willie" Willison with a Purple Heart while on the USS Repose Hospital Ship. 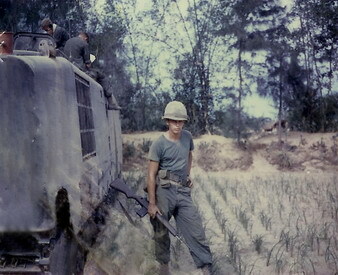 Wayne was with Echo 2/9 and was wounded on May 14, 1967 while on Operation Hickory in Vietnam. 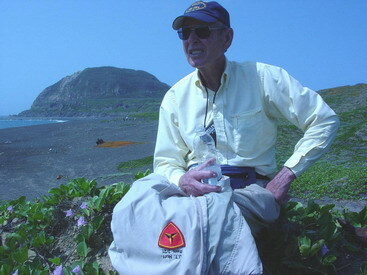 Photo of my friend Jim Huff sitting on the beach at Iwo in front of Mt. Suribachi at the 60th Anniversary Reunion in March of 2005. 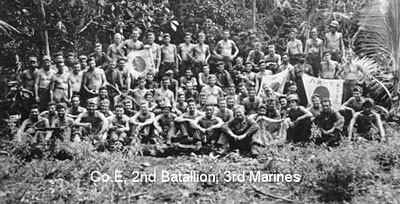 Jim landed on Iwo with I Company 3rd Battalion 21st Regiment 3rd Marine Division and was wounded in March during the battle somewhere near the 3rd airfield. 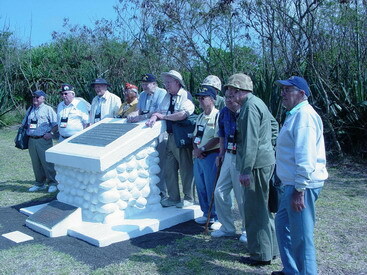 Photo of Iwo vets gathered around the 3rd and 4th Marine Division Cemetary Monument on Iwo during the 60th Anniversary Reunion. Killed in action on 8 Mar 1944, on Iwo Jima. 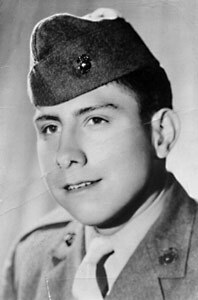 He served with Co. B, 1st Bn, 21st Marines, 3rd Division. 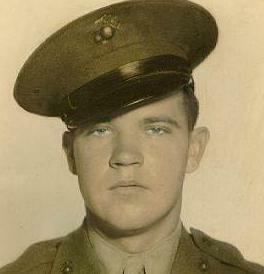 He was a house painter from Pine Bluff, AR., and age 23 at the time of his death. 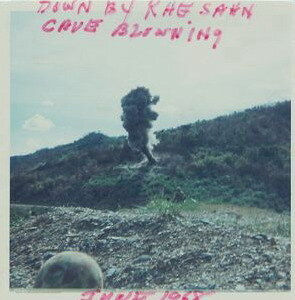 Kenneth R. Blacketer was with Co. K., 3rd Bn., 9th Marines. He served on Bougainville, Guam, and Iwo Jima. His was from Siletz, Oregon. He was 1/2 native american and 1/2 Irish, but he looked pure Irish. 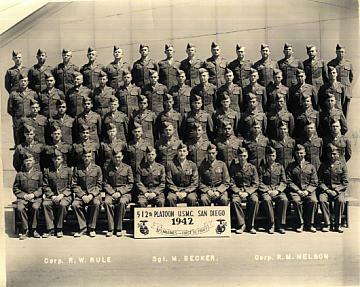 He was discharged as a Corporal. Note the Caltrap on John's shoulder. Bill Byfield (? )- San Diego, Ca. 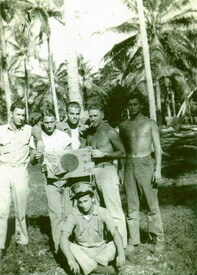 This is a photo taken during the liberation of Guam, 1944. 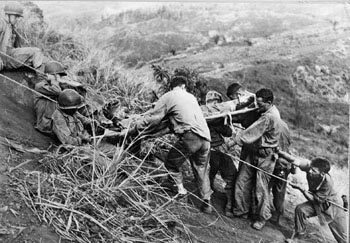 A tram system was constructed to transport wounded down from Fonte Ridge (Nimitz Plateau-now). 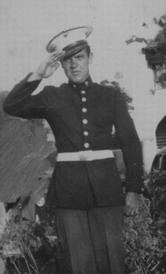 My father, Corporal George F. O'Brien-USMCR, (holding onto the rope with his left hand), served with HqCo,1stBn,21stMar(Rein),FMF from September 1942 to November 1945. 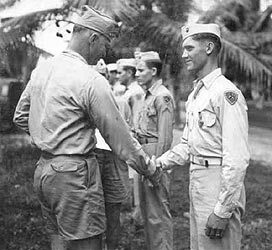 He participated in the battles of Bougainville, Guam, and Iwo Jima. Maybe someone may be able to identify the others in the photo. Emmett was originally with K-3-5 1st Mar Div from Jan 65 till July 65 when the Battalion left for Okinawa By Ship (USS Mitchell). Upon arrival on The island Of Okinawa changed it's designation to B-1-3. 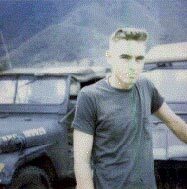 Emmett served as a M-60 Gunner with B Company in Vietnam from Oct, 1965 till March of 1966, When after operation Orange, and the losses which the company incurred, most of the L/cpl's and below went to D-1-3, and B-1-3 was reformed with new members. 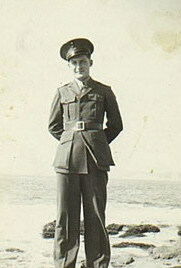 Emmett was wounded twice. 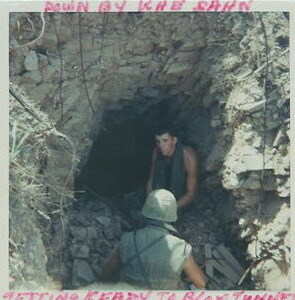 First Time was during Operation Orange April 5th 1966 (Left leg), and again a couple Months Later.